Gary Johnson has something audacious to tell Florida voters: if he overcomes the odds and is elected president, he promises to submit a balanced budget to Congress his first year in office. “I think we need to balance the federal budget, so that’s a $1.4 trillion reduction in spending now,” he said. The Libertarian Party candidate views runaway deficits as “the single greatest threat to our national security,” and says that he would end bloated stimulus programs and earmarks, do “responsible entitlement reform,” and repeal the signature healthcare policies of the past two presidents. Johnson, a former two-term governor of New Mexico, is in Florida ahead of the state’s Libertarian Party convention in Orlando this weekend. Johnson is speaking Wednesday night at a gathering of the Libertarian Party of Broward County, which is meeting at the Denny’s restaurant at 3151 NW 9th Ave. in Fort Lauderdale from 7 to 9 p.m.
“I didn’t know it would be at a Denny’s, but it wouldn’t be my first Denny’s,” he said. He is holding lunch and evening fundraisers in Palm Beach County Thursday. Johnson says that here, as in other states, “there’s a real discontent with the status quo.” He is offering “a message that changes the world for a little better” – one that would turn the political status quo on its head. Johnson proposes pulling back spending across the board, greatly reducing the federal government’s involvement in the economy – no more bailouts and no more support for Fannie Mae and Freddie Mac – and sharply restricting the role of the Federal Reserve to focus on maintaining price stability, while auditing the bank to make it more transparent. He says he also wants to throw out the federal tax system and replace it with the “Fair Tax,” which would tax expenditures rather than income. He says it would make America’s exports more competitive, make the country more attractive for companies – and be fairer. In December, after getting miniscule support and media attention in the Republican primary race, he left the GOP and launched his Libertarian campaign. He is the best-known candidate in the lengthy Libertarian field; the party will choose its nominee at its national convention in Las Vegas in May. A Libertarian candidate has never received above 1 percent in a U.S. presidential election, but Johnson gave several reasons why he might be able to break through the dominant two-party system. One is being on the ballot in all 50 states, as the national Libertarian Party expects will happen for its nominee. Another is that, according to Johnson, “65 percent of Americans right now say they would consider voting for a third-party candidate.” When Ross Perot ran in 1992, that number was about 40 percent, he noted. “Anything can happen, and then there is the notion that a Libertarian candidate could poll in the 15 percent range and be on the debate stage in the general election. And to me that’s an opportunity to advance these ideas that I think really do offer up a solution,” he said. 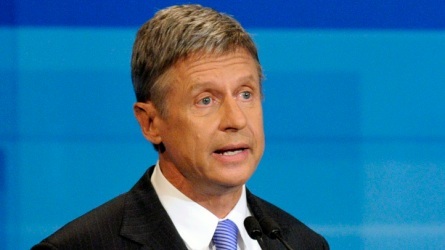 Johnson, who was governor of New Mexico from 1995 to 2003, emphasized that he has the resume to back up his agenda as well. He cut taxes 14 times, left the state with a balanced budget, and was known as “Governor Veto” for his prodigious use of the veto pen for bills from both Democrats and Republicans. Just two of his vetoes were overturned, he added. Johnson faces an uphill battle to make a significant impact on the general election this fall, but he has climbed mountains before – some of the tallest in the world. Johnson has scaled the highest peaks on four continents, including Mount Everest. He has three mountains to go, he said. He says he has competed as an athlete in mountain bike races and ski competitions his whole life. Last Saturday, he and a teammate took third place among about 25 teams in a ski contest in Taos, New Mexico, where he lives.